The Levant (/ləˈvænt/) is an approximate historical geographical term referring to a large area in the Eastern Mediterranean, primarily in Western Asia. In its narrowest sense, it is equivalent to the historical region of Syria. In its widest historical sense, the Levant included all of the eastern Mediterranean with its islands; that is, it included all of the countries along the Eastern Mediterranean shores, extending from Greece to Cyrenaica. 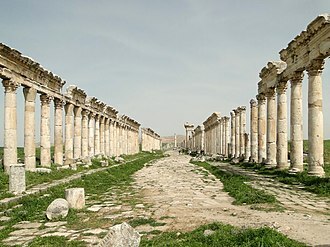 Today, "Levant" is the term typically used by archaeologists and historians with reference to the history of the region. 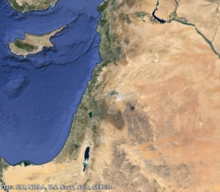 Scholars have adopted the term Levant to identify the region due to it being a "wider, yet relevant, cultural corpus" that does not have the "political overtones" of Syria-Palestine. 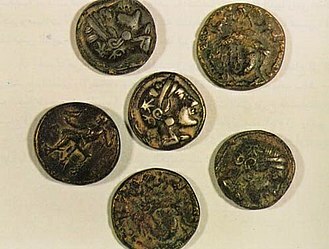 [b][c] The term is also used for modern events, peoples, states or parts of states in the same region, namely Cyprus, Egypt, Iraq, Israel, Jordan, Lebanon, Palestine, Syria, and Turkey are sometimes considered Levant countries (compare with Near East, Middle East, Eastern Mediterranean and Western Asia). 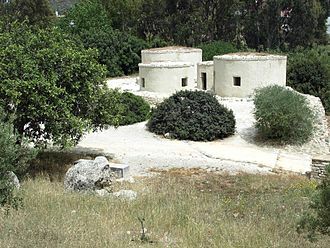 Several researchers include the island of Cyprus in Levantine studies, including the Council for British Research in the Levant, the UCLA Near Eastern Languages and Cultures department, Journal of Levantine Studies and the UCL Institute of Archaeology, the last of which has dated the connection between Cyprus and mainland Levant to the early Iron Age. Archaeologists seeking a neutral orientation that is neither biblical nor national have used terms such as Levantine archaeology and archaeology of the Southern Levant. While the usage of the term "Levant" in academia has been restricted to the fields of archeology and literature, there is a recent attempt to reclaim the notion of the Levant as a category of analysis in political and social sciences. Two academic journals were recently launched: Journal of Levantine Studies, published by the Van Leer Jerusalem Institute and The Levantine Review, published by Boston College. 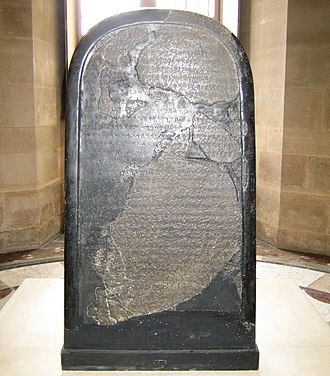 The word Levant has been used in some translations of the term ash-Shām as used by the organization known as ISIL, ISIS, and other names, though there is disagreement as to whether this translation is accurate. The largest religious group in the Levant are the Muslims and the largest cultural-linguistic group are Arabs, due to the Muslim conquest of the Levant in the 7th century and subsequent Arabization of the region. Other large ethnic groups in the Levant include Jews, Kurds, Turkmens, Assyrians and Armenians. Until the establishment of the modern State of Israel in 1948, Jews lived throughout the Levant alongside Muslims and Christians; since then, almost all have been expelled from their homes and sought refuge in Israel. There are many Levantine Christian groups such as Greek, Oriental Orthodox (mainly Syriac Orthodox, Coptic, Georgian, and Maronite), Roman Catholic, Nestorian, and Protestant. Armenians mostly belong to the Armenian Apostolic Church. There are Levantines or Franco-Levantines who are mostly Roman Catholic. There are also Circassians, Turks, Samaritans, and Nawars. There are Assyrian peoples belonging to the Assyrian Church of the East (autonomous) and the Chaldean Catholic Church (Catholic). 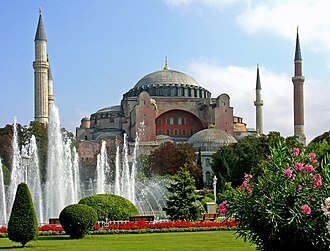 In addition, this region has a number of sites that are of religious significance, such as Al-Aqsa Mosque, the Church of the Holy Sepulchre, and the Western Wall in Jerusalem. Map representing the distribution of the Arabic dialects in the area of the Levant. 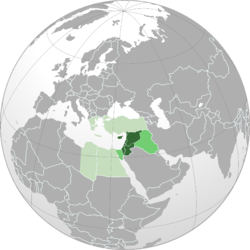 Most populations in the Levant speak Levantine Arabic (شامي, Šāmī), usually classified as the varieties North Levantine Arabic in Lebanon, Syria, and parts of Turkey, and South Levantine Arabic in Palestine and Jordan. Each of these encompasses a spectrum of regional or urban/rural variations. 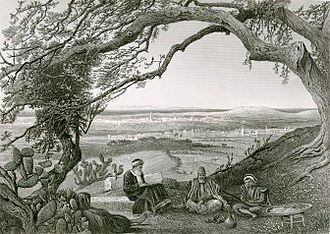 In addition to the varieties normally grouped together as "Levantine", a number of other varieties and dialects of Arabic are spoken in the Levant area, such as Levantine Bedawi Arabic and Mesopotamian Arabic. Among the languages of Israel, the official language is Hebrew; Arabic was until July 19, 2018, also an official language. The Arab minority, in 2018 about 21% of the population of Israel, speaks a dialect of Levantine Arabic essentially indistinguishable from the forms spoken in the Palestinian territories. Of the languages of Cyprus, the majority language is Greek, followed by Turkish (in the north). 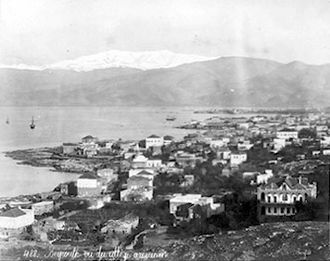 Two minority languages are recognized: Armenian, and Cypriot Maronite Arabic, a hybrid of mostly medieval Arabic vernaculars with strong influence from contact with Greek, spoken by approximately 1000 people. Some communities and populations speak Aramaic, Greek, Armenian, Circassian, French, or English. 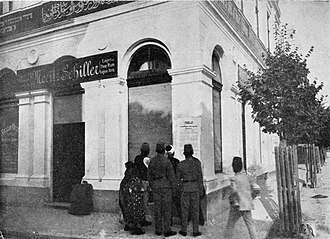 August Jochmus (freiherr von Cotignola)'s The Syrian War and the Decline of the Ottoman Empire, 1840-1848: In Reports, Documents, and Correspondences, Etc, Volume 1, published in 1883, stated that Italian was previously the most common western European language in the Levant, but that it was being replaced by French. ^ Gagarin 2009, p. 247; Encarta 2009, "Levant"; Oxford Dictionaries 2015. ^ a b Oxford Dictionaries 2015. 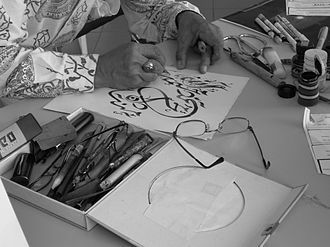 ^ a b c d Encarta 2009, "Levant"
^ Naim 2011, p. 921. 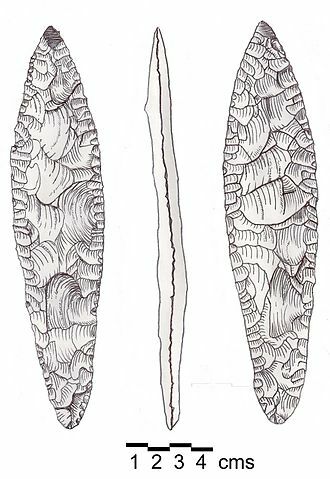 ^ LEVANT archaic The eastern part of the Mediterranean with the islands and neighbouring countries. New Oxford Dictionary of English, 2nd ed., revised, 2005. ^ LEVANT, THE. 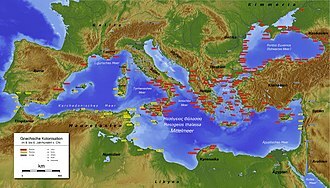 A general term formerly given to the E shores of the Mediterranean Sea from W Greece to Egypt. The Penguin Encyclopedia, revised 2nd ed., 2004. ^ LEVANT, (vieilli) Le Levant: les pays, les régions qui sont au levant (par rapport à la France) et spécialt. 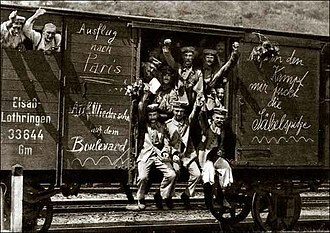 les régions de la Méditerrranée orientale. Le Nouveau Petit Robert de la langue française, (1993 revised ed.). ^ Thomas Evan Levy, Historical Biblical Archaeology and the Future: The New Pragmatism, Routledge, 2016 ISBN 1134937466. Thomas E. Levy, "The New Pragmatism", p. 8: "after 1994, it is possible to see an increase in the use of the less geographically specific and more political [sic] neutral words 'Levant' or 'Levantine' in scholarly citations.... 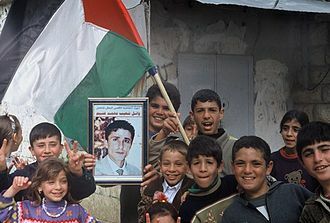 It is important to highlight the pedigree of the term 'Syro-Palestinian' and its gradual replacement by the term 'Levant' or 'Levantine' because the latter is a more culturally and politically neutral term that more accurately reflects the tapestry of countries and peoples of the region, without assuming directionality of cultural influence.". Aaron A. Burke, "The Archaeology of the Levant in North America: The Transformation of Biblical and Syro-Palestinian Archaeology" p. 82ff: "A number of factors account for the gradual emergence during the past two decades of what is now widely identified as Levantine archaeology in North America... a growing consensus regarding the appropriate terminology... archaeological field research in the Levant"
^ William G. Dever, The Lives of Ordinary People in Ancient Israel: When Archaeology and the Bible Intersect, 2012, ISBN 0802867014, p. 249: "Today, however, the discipline is often called Palestinian, Syro-Palestinian, or Levantine archaeology." ^ Mark Gasiorowski, The Government and Politics of the Middle East and North Africa, 2016 ISBN 081334994X, p. 5: "...today the term Levantine can describe shared cultural products, such as Levantine cuisine or Levantine archaeology"
^ Michel Elias Andraos, "Levantine Catholic Communities in the Diaspora at the Intersection of Many Identities and Worlds", in Michael L. Budde, Scattered and Gathered: Catholics in Diaspora, 2017 ISBN 1532607091 p. 24: "The word 'Levantine' in the title is used on purpose instead of the 'Middle East' or the 'Near East'.... I use 'Levantine' more than the two other designations, because this is the term being used more often nowadays by Christian communities in the Middle East to describe their shared identity as al-maseeheyoun al-mashriqeyoun, Levantine Christians"
^ a b Douglas Harper, Online Etymology Dictionary. "Levant". Dictionary.com. Retrieved 2012-07-27. ^ Balme, Maurice; Morwood, James. "Chapter 36". Oxford Latin Course Part III (2nd ed.). p. 19. ^ "Journal of Levantine Studies". The Van Leer Jerusalem Institute. Retrieved 30 January 2014. ^ Braudel, p. [page needed]. ^ Sandra Rosendahl (2006-11-28). "Council for British Research in the Levant homepage". Cbrl.org.uk. Retrieved 2010-07-05. ^ Dever, William G. "Syro-Palestinian and Biblical Archaeology", pp. 1244-1253. 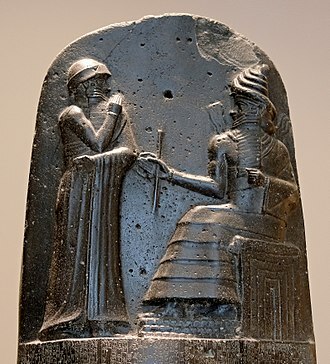 ^ Sharon, Ilan "Biblical archaeology" in Encyclopedia of Archaeology Elsevier. ^ Irshaid, Faisal (2 December 2015). "Isis, Isil, IS or Daesh? One group, many names". BBC. Retrieved 21 July 2018. ^ Kennedy, Hugh N. (2007). 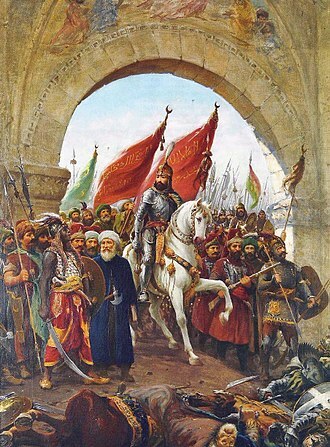 The Great Arab Conquests: How the Spread of Islam Changed the World We Live In. Da Capo Press. p. 376. ISBN 978-0306817281. ^ Lapidus, Ira M. (13 October 2014) . A History of Islamic Societies (3rd ed.). Cambridge University Press. p. 70. ISBN 978-0521514309. ^ Shoup, John A (2011-10-31). Ethnic Groups of Africa and the Middle East: An Encyclopedia. ISBN 9781598843620. Retrieved 26 May 2014. ^ "Levant (al-Shaam) - Syria, Lebanon, Israel, Palestine and Jordan Religious Composition". The Gulf/2000 Project, School of International and Public Affairs of Columbia University. 2017. Retrieved 2018-08-31. ^ "Christian Population of Middle East in 2014". The Gulf/2000 Project, School of International and Public Affairs of Columbia University. 2017. Retrieved 2018-08-31. ^ "Church of the Holy Sepulchre, Jerusalem". 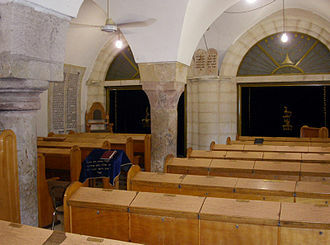 Jerusalem: Sacred-destinations.com. 2010-02-21. Retrieved 2012-07-07. ^ "Jordan and Syria". Ethnologue. Retrieved 2018-07-21. ^ a b "Israeli Law Declares the Country the 'Nation-State of the Jewish People'". Retrieved 2018-07-21. ^ Versteegh, Kees (2011). Encyclopedia of Arabic Language and Linguistics. Brill. p. 541. ISBN 978-90-04-14976-2. ^ Jochmus, August freiherr von Cotignola). The Syrian War and the Decline of the Ottoman Empire, 1840-1848: In Reports, Documents, and Correspondences, Etc, Volume 1. A. Cohn, 1883. p. RA3-PA179. 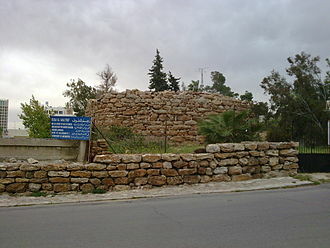 Levantine Heritage site. Includes many oral and scholarly histories, and genealogies for some Levantine Turkish families. Gaza, referred to as Gaza City, is a Palestinian city in the Gaza Strip, with a population of 515,556, making it the largest city in the State of Palestine. 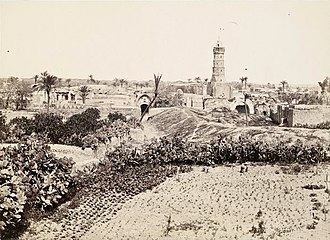 Inhabited since at least the 15th century BC, Gaza has been dominated by different peoples and empires throughout its history. The Philistines made it a part of their pentapolis after the Ancient Egyptians had ruled it for nearly 350 years, under the Romans and the Byzantines, Gaza experienced relative peace and its port flourished. In 635 AD, it became the first city in Palestine to be conquered by the Rashidun army, however, by the time the Crusaders invaded the city in the late 11th century, it was in ruins. 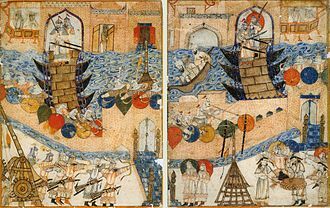 In centuries, Gaza experienced several hardships—from Mongol raids to floods and locusts, reducing it to a village by the 16th century, when it was incorporated into the Ottoman Empire. During the first half of Ottoman rule, the Ridwan dynasty controlled Gaza, the municipality of Gaza was established in 1893. 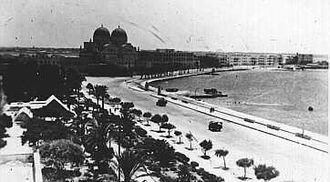 Gaza fell to British forces during World War I, becoming a part of Mandatory Palestine, as a result of the 1948 Arab–Israeli War, Egypt administered the newly formed Gaza Strip territory and several improvements were undertaken in the city. Gaza was captured by Israel in the Six-Day War in 1967, but in 1993, in the months following the 2006 election, an armed conflict broke out between the Palestinian political factions of Fatah and Hamas, resulting in the latter taking power in Gaza. Egypt and Israel consequently imposed a blockade on the Gaza Strip, Israel eased the blockade allowing consumer goods in June 2010, and Egypt reopened the Rafah border crossing in 2011 to pedestrians. The primary economic activities of Gaza are small-scale industries and agriculture, the blockade and recurring conflicts has put the economy under severe pressure. The majority of Gazas inhabitants are Muslim, although there is a Christian minority, Gaza has a very young population with roughly 75% under the age of 25. The city is administered by a 14-member municipal council. 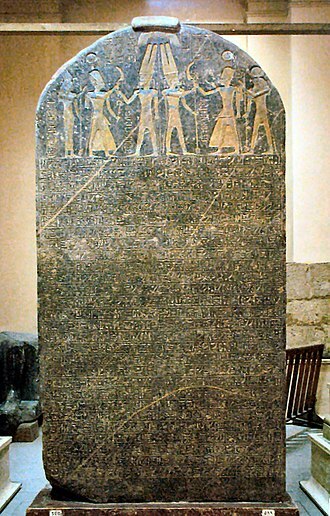 The name Gaza is first known from records of Thutmose III of Egypt in the 15th century BC. In Semitic languages, the meaning of the city name is fierce, other proper Arabic transliterations for the Arabic name are Ghazzah or Ġazzah. The Arabian Peninsula, simplified Arabia is a peninsula of Western Asia situated northeast of Africa on the Arabian plate. From a geological perspective, it is considered a subcontinent of Asia and it is the largest peninsula in the world, at 3,237,500 km2. The Arabian Peninsula consists of the countries Yemen, Qatar, Kuwait, Saudi Arabia, the Arabian Peninsula plays a critical geopolitical role in the Middle East and the Arab world due to its vast reserves of oil and natural gas. Before the modern era, it was divided into four regions, Najd, Southern Arabia. Hejaz and Najd make up most of Saudi Arabia, Southern Arabia consists of Yemen and some parts of Saudi Arabia and Oman. Eastern Arabia consists of the coastal strip of the Persian Gulf. 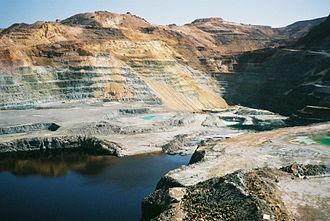 The most prominent feature of the peninsula is desert, but in the southwest there are mountain ranges, harrat ash Shaam is a large volcanic field that extends from the northwestern Arabian Peninsula into Jordan and southern Syria. The peninsulas constituent countries are Kuwait, Qatar, the island nation of Bahrain lies off the east coast of the peninsula. Six countries form the Gulf Cooperation Council, this is a disputed term. The Kingdom of Saudi Arabia covers the part of the peninsula. The majority of the population of the live in Saudi Arabia. The peninsula contains the worlds largest reserves of oil, Saudi Arabia and the UAE are economically the wealthiest in the region. Qatar, a peninsula in the Persian Gulf on the larger peninsula, is home of the Arabic-language television station Al Jazeera. Kuwait, on the border with Iraq, is an important country strategically, though historically lightly populated, political Arabia is noted for a high population growth rate - as the result of both very strong inflows of migrant labor as well as sustained high birth rates. The population tends to be young and heavily skewed gender ratio dominated by males. In many states, the number of South Asians exceeds that of the local citizenry, the four smallest states, which have their entire coastlines on the Persian Gulf, exhibit the worlds most extreme population growth, roughly tripling every 20 years. Levent is a neighbourhood and one of the main business districts of Istanbul, located on the European side of the city. It is a part of the municipality of Beşiktaş which is situated to the north of the Golden Horn, Levent is in direct competition with the nearby Maslak business district for new skyscraper projects. Levent hosts the tallest completed skyscraper of Turkey, the 54-floor Sapphire, the stations Gayrettepe, Levent and 4. Levent along the M2 line of the Istanbul Metro serve the Levent business district, Levent is a name for men in Turkey that derives from the Levend, a type of soldier of the Ottoman Navy. 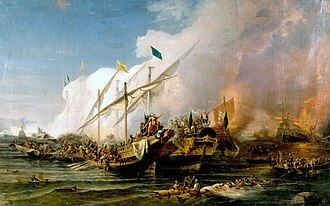 Levend itself has derived from Levantino which means Person from the Levant in Italian and this was how the Italians used to call the Ottoman sailors, a name which was adopted by the Ottoman Turks. 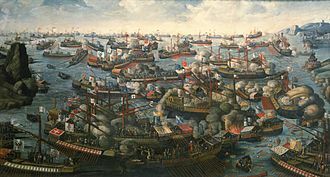 The use of the word levend for describing seamen first appeared in the Ottoman Turkish language during the 16th century, the nearby İstinye neighbourhood on the European shoreline of the Bosphorus featured an important shipyard and dock for maintaining and repairing the military vessels of the Ottoman Navy. 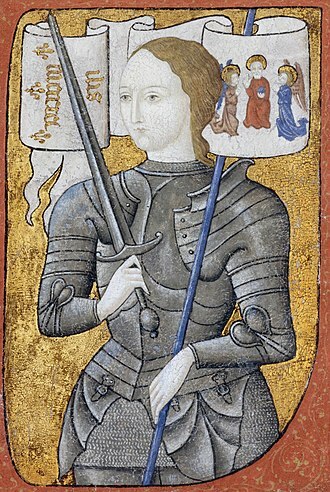 The 15th century was the century which spans the Julian years 1400 to 1500. In Europe, the 15th century is seen as the bridge between the Late Middle Ages, the Early Renaissance, and the Early modern period. 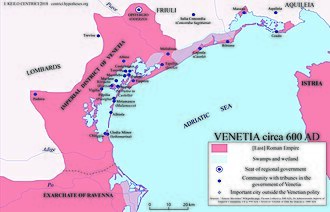 Many technological and cultural developments of the 15th century can in retrospect be seen as heralding the European miracle of the following centuries, in religious history, the Roman Papacy was split in two parts in Europe for decades, until the Council of Constance. The division of the Catholic Church and the unrest associated with the Hussite movement would become factors in the rise of the Protestant Reformation in the following century. 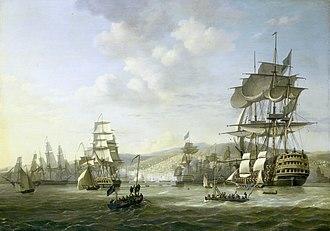 The event forced Western Europeans to find a new route, adding further momentum to what was the beginning of the Age of Discovery. 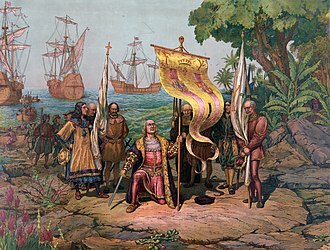 Explorations by the Spanish and Portuguese led to European sightings of the Americas and these expeditions ushered in the era of the Portuguese and Spanish colonial empires. 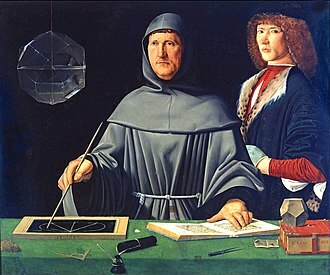 The fall of Constantinople led to the migration of Greek scholars and texts to Italy and these two events played key roles in the development of the Renaissance. The Spanish Reconquista leads to the fall of the Emirate of Granada by the end of the century, ending over seven centuries of Muslim rule. 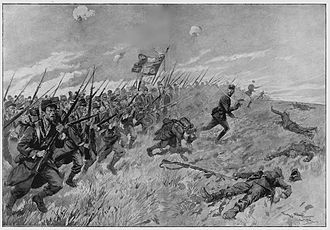 The Hundred Years War end with a decisive French victory over the English in the Battle of Castillon, financial troubles in England following the conflict results in the Wars of the Roses, a series of dynastic wars for the throne of England. The conflicts ends with the defeat of Richard III by Henry VII at the Battle of Bosworth Field, establishing the Tudor dynasty in the part of the century. 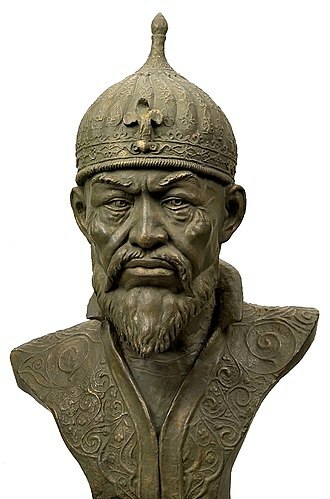 In Asia, under the rule of the Yongle Emperor, who built the Forbidden City and commanded Zheng He to explore the world overseas, tamerlane established a major empire in the Middle East and Central Asia, in order to revive the Mongol Empire. In Africa, the spread of Islam leads to the destruction of the Christian kingdoms of Nubia, the formerly vast Mali Empire teeters on the brink of collapse, under pressure from the rising Songhai Empire. In the Americas, both the Inca Empire and the Aztec Empire reach the peak of their influence, 1400s 1401, Dilawar Khan establishes the Malwa Sultanate in present-day central India 1402, Ottoman and Timurid Empires fight at the Battle of Ankara resulting in Timurs capture of Bayezid I.
Amman is the capital and most populous city of Jordan, and the countrys economic and cultural centre. Situated in north-central Jordan, Amman is the centre of the Amman Governorate. The city has a population of 4,007,526, Amman is considered to be among the most liberal and westernized Arab cities. 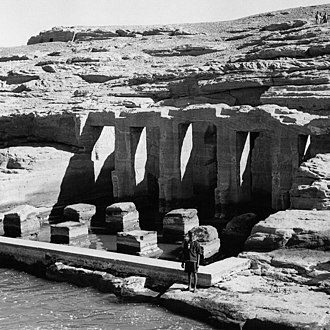 It is a major tourist destination in the region, particularly among Arab, the earliest evidence of settlement in the area is a Neolithic site known as Ain Ghazal. Its successor was known as Rabbath Ammon, which was the capital of the Ammonites, as Philadelphia and it was initially built on seven hills but now spans over 19 hills combining 27 districts, which are administered by the Greater Amman Municipality headed by its mayor Aqel Biltaji. 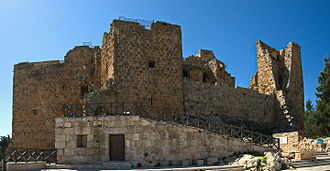 Areas of Amman have either gained their names from the hills or valleys they lie on, such as Jabal Lweibdeh, East Amman is predominantly filled with historic sites that frequently host cultural activities, while West Amman is more modern and serves as the economic center of the city. Approximately 2 million visitors arrived in Amman in 2014, which ranked it as the 93rd most visited city in the world, Amman has a relatively fast growing economy, and it is ranked Beta− on the global city index. Moreover, it was named one of the Middle East and North Africas best cities according to economic, environmental, the city is among the most popular locations in the Arab world for multinational corporations to set up their regional offices, alongside Doha and only behind Dubai. It is expected that in the next 10 years these three cities will capture the largest share of multinational corporation activity in the region. 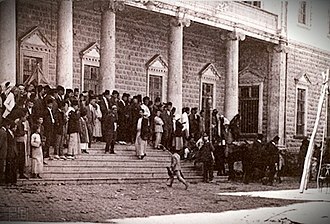 Amman derives its name from the 13th century BC when the Ammonites named it Rabbath Ammon, over time, the term Rabbath was no longer used and the city became known as Ammon. 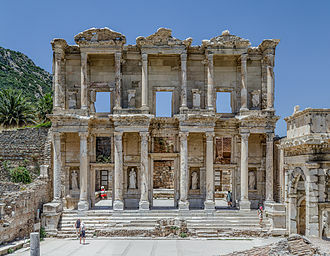 The influence of new civilizations that conquered the city changed its name to Amman. 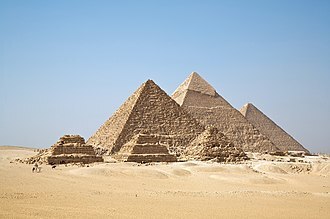 In the Hebrew Bible, it is referred to as Rabbat ʿAmmon, Ptolemy II Philadelphus, the Macedonian ruler of the Ptolemaic Kingdom who reigned from 283 to 246 BC, renamed the city to Philadelphia after occupying it. The Taurus Mountains are a mountain complex in southern Turkey, dividing the Mediterranean coastal region of southern Turkey from the central Anatolian Plateau. The system extends along a curve from Lake Eğirdir in the west to the reaches of the Euphrates. 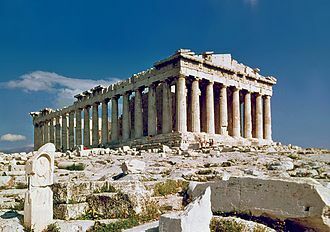 It is a part of the Alpide belt in Eurasia, the mountains are a place of many ancient storm-god temples. 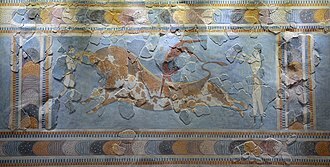 The Hurrians, probably originators of the various storm-gods of the ancient Near East, were a people whom modern scholars place in the Taurus Mountains at their probable earliest origins, a Bronze Age archaeological site, where early evidence of tin mining was found, is at Kestel. 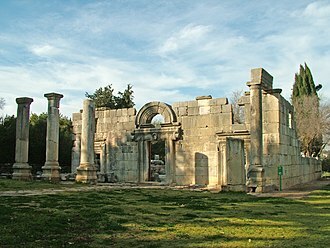 The pass known in antiquity as the Cilician Gates crosses the north of Tarsus. 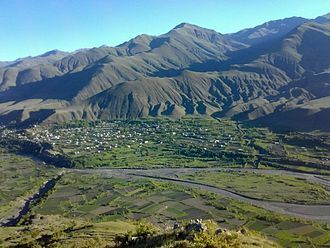 The Amanus range in southern Turkey is where the Taurus Mountains are pushed up as three tectonic plates come together, the Amanus is a natural frontier, west is Cilicia, east is Syria. 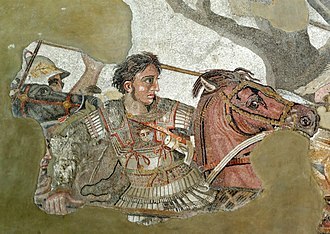 There are several passes, like the Amanian Gate, which are of great strategical importance, in 333 BCE at the Battle of Issus, Alexander the Great defeated Darius III Codomannus on the foothills along the coast between these two passes. 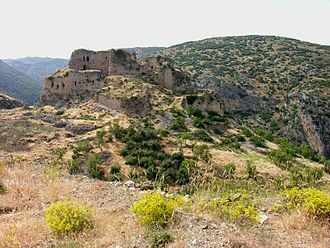 The historic region of Syria is an area located east of the Mediterranean sea. The oldest attestation of the name Syria is from the 8th century BC in an inscription in Hieroglyphic Luwian and Phoenician. 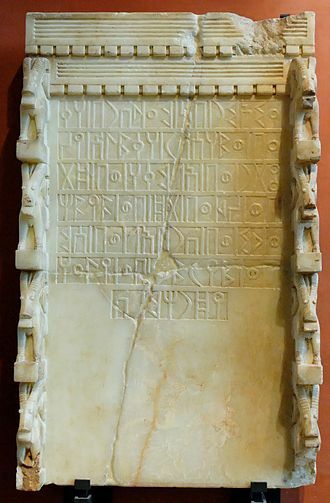 In this inscription the Luwian word Sura/i was translated to Phoenician ʔšr Assyria, for Herodotus in the 5th century BC, Syria extended as far north as the Halys river and as far south as Arabia and Egypt. For Pliny the Elder and Pomponius Mela, Syria covered the entire Fertile Crescent and this late definition is equivalent to the region known in Classical Arabic by the name ash-Shām الشام /ʔaʃ-ʃaːm/, which means the north. 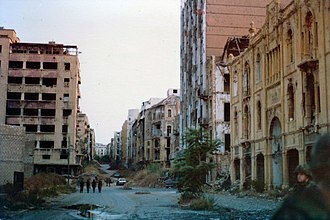 After World War I, the name Syria was applied to the French Mandate for Syria and the Lebanon, the area was passed to French and British Mandates following World War I and divided into Greater Lebanon, various Syrian-mandate states, Mandatory Palestine and Transjordan. 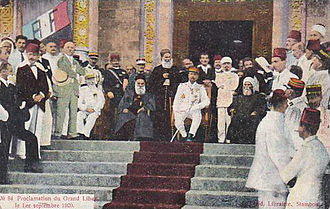 The Syrian-mandate states were unified as the State of Syria. 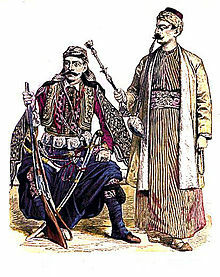 Throughout this period, pan-Syrian nationalists advocated for the creation of a Greater Syria, the name Syria derives from the ancient Greek name for Syrians, Σύριοι Syrioi, which the Greeks applied without distinction to various Near Eastern peoples living under the rule of Assyria. Modern scholarship confirms the Greek word traces back to the cognate Ἀσσυρία, the classical Arabic pronunciation of Syria is Sūriyya. This name was not widely used among Muslims before about 1870, according to the Syrian Orthodox Church, Syrian used to mean Christian in early Christianity. In English, Syrian historically meant a Syrian Christian, following the declaration of Syria in 1936, the term Syrian became to designate citizens of that state regardless of ethnicity. The adjective Syriac has come into use since as a demonym to avoid the ambiguity of Syrian. 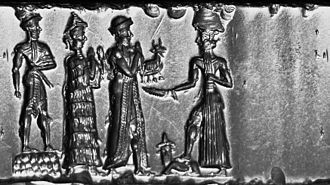 To some opinions, the origin of the Hellenistic term Syria is bound in the etymology of the Neo-Assyrian Empire, Syria in this wider sense could correspond to Greater Assyria and include all of the Levant and Mesopotamia. Currently, the Arabic term Suriyya refers to the state of Syria. The term etymologically means land of the hand, referring to the fact that for someone in the Hejaz facing east. Sham comes from the Arabic consonantal root shin-hamza-mim ش ء م, as seen in alternative Arabic spellings such as شأم, there is no connection with the name of Shem son of Noah, as is sometimes assumed. Galata Tower, built in 1348 by the Republic of Genoa in the citadel of Galata (modern Karaköy) on the northern shore of the Golden Horn, across Constantinople (Fatih) on the southern shore, is one of the most famous architectural landmarks of the Italian Levantine community in Istanbul. Church of St. Anthony of Padua on İstiklal Avenue in the Beyoğlu (Pera) district of Istanbul, which was constructed between 1906 and 1912 by the city's Italian Levantine community. A distant view of Levent's skyline from the Bosphorus strait in Istanbul. A catamaran Seabus on the Bosphorus, with the skyline of Levent in the background. Istanbul Sapphire is the first tower at left. View of Finansbank Tower and Büyükdere Avenue in Levent, from the observation deck of Istanbul Sapphire. Kanyon Towers & Mall on Büyükdere Avenue in Levent. 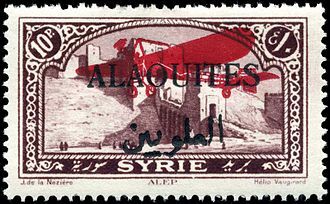 A 10-piastre Syrian stamp used in the Alawite State, bearing an overprint overprinted "ALAOUITES"
Turkish forces under Colonel Şükrü Kanatlı entered İskenderun on July 5, 1938.